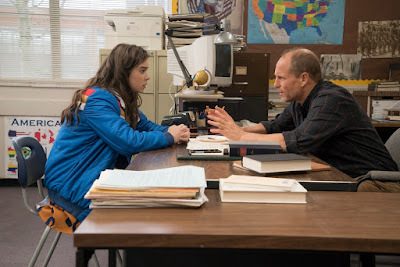 It stars Hailee Steinfeld as Nadine Franklin, a girl who has had a turbulous family life ever since she was young. There were only two people who should could completely trust: her dad and her best friend Krista (Haley Lu Richardson). At seventeen she finds herself without either. Her dad died of a sudden heart attack and her friend started dating her brother (who appears to have little love for his sister). Thus we follow Nadine through the toughest time of high school while she has no friends to speak of. 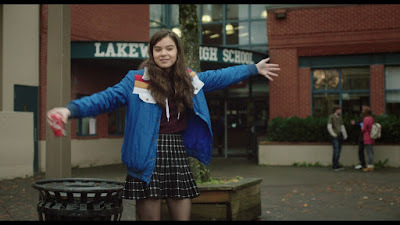 She has a crush on a fellow student who has been released from juvenile hall, but a true romance might be found with the nerdy Asian kid who makes stop motion movies in his bedroom. She hates her mom and wishes she’d died, but she may not be perceptive to the fact her mom might need some help herself. The only person in her life to offer any sort of comfort is with her teacher Mr. Bruner (Woody Harrelson), who seems to be the only one in the world who understands where she is coming from and how to handle her. In fact, I want to take a moment to give special praise to this student/teacher relationship, as it is never sexual nor improper. We live in a day and age where these sort of relationships are viewed with suspicion (and sometimes with good reason), but in an ideal world these relationships would be healthy and helpful to both parties involved. Mr. Bruner is a great deal of help to a student who needs it the most. 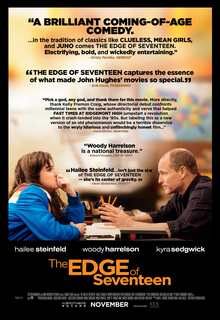 That is what a great teacher should be, and it’s nice to see at least one movie that entertains the notion. That’s not to say this is a movie that lives in a fantasy world though. The emotions Nadine go through are all very real. That is why I found myself crying as much as I was smiling. We smile because we know things can get better. There is a whole bright future this girl simply can not see yet. We cry though because we also have been there. We’ve all been in that position where the world seems to be against you. We’ve all loved someone who has eyes for someone else. In some cases we still go through these things. Some of us come from broken families and we understand the hardship of dealing with a family member or two that seem determined to sabotage their own life (and bring down everyone around them). The movie was written and directed by Kelly Fremon Craig, who seems to be invoking lessons she learned from the late John Hughes (and, possibly, from he own life as well). Like him, she treats her characters not as props, but as real humans. She understands that while these are kids, they are on the cusp of adulthood, and as such they are going through emotions that are familiar yet foreign to us. She also produces with the legendary James L. Brooks, who knows a thing or two about tear jerkers himself. Though the movie is appropriately rated R for language and sexual situations, it is the kind of movie that parents should watch with their teenage kids as a valuable teaching tool for what the future might potentially bring. For those without kids it will be a reminder of a time where things weren’t so sunny and the future looked bleak. On that level, “The Edge of Seventeen” can be seen as a reminder of where we came from, and how relieved we are to be moving forward in time. Parents, there is some strong language, scenes of drug use, and sexual situations that come close to being explicit. Because of the importance of the film, I do recommend the movie for ages 14 and up provided they are viewing this with a parent.